Home » Atheism » Scientism vs. Philosophism? Earlier this week, Twitter user @fardarter alerted me to a paper recently published by Massimo Pigliucci, in the journal Midwest Studies in Philosophy. The paper isn’t very technical (and, not behind a paywall), so non-philosphers shouldn’t be afraid of taking a look, assuming that you’re interested in its core topic, namely what Pigliucci describes as the “scientistic turn” in the atheist movement. totalizing attitude that regards science as the ultimate standard and arbiter of all interesting questions; or alternatively that seeks to expand the very definition and scope of science to encompass all aspects of human knowledge and understanding. As you might expect, the paper has attracted responses from some of its targets. Jerry Coyne’s response is rather ill-tempered, even as he criticises Pigliucci for his “arrogance” and “attack-doggishness”. PZ Myers is characteristically snarky in his dismissal of Pigliucci’s paper, pointing out that Pigliucci needs to cherry-pick examples for his case to have any merit at all. Before I add my own (slightly tangential) contribution, I’d also want to remind you of 50 Great Myths About Atheism , in which Russell Blackford and Udo Schüklenk address the topic “Atheism implies Scientism” as myth #43. My brief review of “50 Great Myths” is available on that Amazon page, but in brief, this chapter – and the rest of the book – are well-worth reading for a nuanced take on this and other important issues. And, nuance is precisely the problem with the two responses to Pigliucci highlighted above, as well as with parts of Pigliucci’s paper itself. There’s a world of difference between the “proper”, and unapologetic, scientism of Alex Rosenberg and the strong naturalism of a Coyne or a Myers, just as there’s a world of difference between the out-there philosophising of Nick Bostrom’s “Simulation argument” and the (typically) pragmatic work of a Daniel Dennett, for example. I think that atheism itself is not a scientific position, but a philosophical position heavily informed by science, the difference arising due to the fact that, as Massimo has noted, it is pretty much impossible to pin down a set of specific ‘God hypotheses’ that we could mechanically verify or falsify. To be more concrete, you say “Why shouldn’t we reject ideas that might be pretty to some people, but contradict reality?” To which I reply: because you can’t actually show that those ideas contradict reality. What you can do is show that given the theories which form our best-supported science and a satisfactory philosophy of science, those ideas ought to be rejected. To say that science itself has done the work is to skip a step, which may seem nitpicky here, but can be crucial when the science is at least a bit hazy and can be perceived by some as ambiguous – in the case of evo psych, say. Scientific reasoning and philosophy are partners in a truth-seeking endeavour, and it’s precisely because of this intersection (in atheism) that we need to be aware of nuance, because when you have firmly-held beliefs – and when you’re challenging firmly held-beliefs in others – it can be easy to become complacent or dogmatic about our strategies, and even our epistemic habits. Spending a lot of time with younger atheists, I notice plenty of the smugness (unwittingly, no doubt) captured in the picture below. 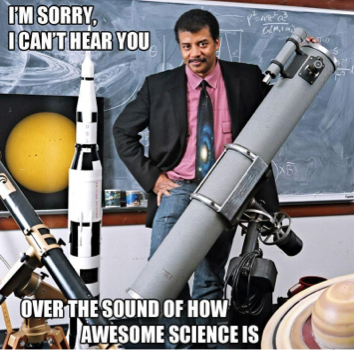 Here Neil deGrasse Tyson is used to make the point that science is awesome (which it certainly is) – in fact, so awesome that nothing else can make an impact. In my experience (and a similar point is made at the conclusion of the comment that I quote above), this sort of attitude is contiguous with the attitude that says “religion is universally bad”, and gets in the way of many attempts at cross-cultural understanding, or interfaith work. And to my mind, this attitude is currently being reinforced by the fact that many of the prominent new atheists are scientific in outlook, even when they are trying to do philosophy (cf. Sam Harris). Now, this isn’t the fault of these new atheists – as Myers points out in his response, for example, it’s not at all plausible to describe him as being hostile to philosophy. For readers, philosophy is (or, can be) difficult, so it’s no surprise that we might remember, and have more conversations about, scientifically-framed debunkings of the latest quackery from Deepak Chopra or whomever. That pleasure of finding “the evidence” that destroys some opponent’s case is seductive, to be sure, just as it’s satisfying (mostly for reasons of ego, I’d wager) for Pigliucci, Myers and Coyne to trade insults across their respective bows. But perhaps, while they are doing so, readers might want to remind themselves, and sometimes be reminded, that this isn’t a zero-sum game. Blog squabbles are just another example of framing things as a contest, a verbal smack-down, where each party defends turf that they’ve either claimed or been pigeonholed into. Well said. And thanks for pointing out that comment from Pharyngula. It really helped me understand how powerful a role nuance plays in this spat. Isn't this just a problem with the young? Couldn't you substitute theist for atheist and it would be equally true? Quite possibly, even perhaps probably.